An outstanding source of ultra-pure, all natural, non-GMO Whey Protein Isolate, complete with the added benefits of the essential amino acids and free of excess fats, carbs, and additives. This one-of-a-kind formula delivers its benefits without any artificial flavors, colors, or sweeteners, and it mixes easily and instantly. 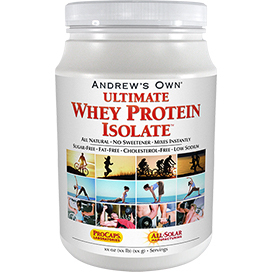 ULTIMATE WHEY PROTEIN ISOLATE is the result of Andrew’s long search for the perfect whey protein. It contains an ideal balance of amino acids and mixes easily – even without a blender. It does not contain undesirable amounts of carbohydrate, lactose, sugar, saturated fat, cholesterol or sodium. It is non-GMO (Not Genetically Modified) and certified Kosher and Halal. Andrew apologizes for the delay in creating his own whey protein, but he knows that once you try it, you’ll agree it was worth the wait. Whey Protein is a dairy-based protein that is considered to be among nature’s best protein sources. It has long been used by elite athletes as their preferred protein source for physical recovery and building muscle. The amino acid profile of our ULTIMATE WHEY PROTEIN ISOLATE is almost identical to that of human muscle containing high levels of all the Essential and Branched Chain amino acids. Our ULTIMATE WHEY PROTEIN ISOLATE is not just for athletes, but is for anyone at any age seeking to retain lean body tissue. In fact, research has shown that combining whey protein with weight training helps retain strength and lean body mass as we age.Our ULTIMATE WHEY PROTEIN ISOLATE is made with ultra-pure Whey Protein Isolate. Its high level of purity cannot be achieved with inferior Whey Protein Concentrates. In fact, our ULTIMATE WHEY PROTEIN ISOLATE ensures the highest levels of protein and is considered fat-free, sugar-free, cholesterol-free and low in sodium; and contains only trace amounts of lactose. Whey Protein Isolate is more expensive than Concentrate, but our Isolate ensures the highest levels of protein and the virtual elimination of undesirable components. Each serving of our ULTIMATE WHEY PROTEIN ISOLATE provides 10 grams of highly absorbable protein with a remarkable 4 1/2 grams of Essential and Branched Chain amino acids! It offers a perfect balance of the highest quality protein for our most vital organs and all of the enzymes that perform our internal work – from energy and fat metabolism to creating beautiful hair and skin. 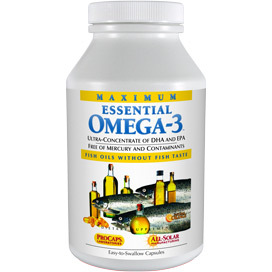 The high quality protein in this product is a dramatic contrast to the inferior protein in the typical American diet. ULTIMATE WHEY PROTEIN ISOLATE also offers a unique experience and unlike typical whey protein, this product mixes instantly without clumps - even using a spoon, and also once mixed, it stays mixed and does not settle out. Best of all, its mild, neutral flavor will enhance and not ruin your favorite beverage or smoothie. In short, ULTIMATE WHEY PROTEIN ISOLATE is the finest whey protein powder in all respects: Technically, Nutritionally and Aesthetically. Mix one or more scoops of Ultimate Whey Protein Isolate with any beverage. Ultimate Whey Protein Isolate mixes easily and is also neutral-tasting. It is fat-free, cholesterol-free and sugar-free and works perfectly with any wellness or weight-loss plan. 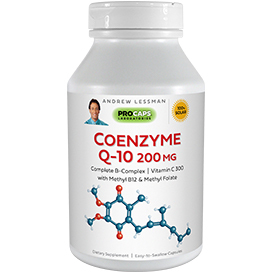 This product is most effective when used as part of a healthy diet and active lifestyle, along with one of Andrew Lessman's multi-vitamin-mineral formulas. 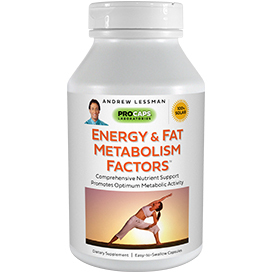 Notice This product is not a sole source of nutrition or stand-alone weight loss product. This stuff is fantastic for added protein in my diet without added calories. I take a tall glass of cold water from the fridge dispenser and add a heaping scoop, along with a scoop of Secure Soy Chocolate and Secure Soy Coffee. Stir with a spoon or small whisk—blends nicely with no lumps. I drink with Energy and Fat Metabolism Factors and feel great for hours and hours—this gets me through my day and is a delicious, healthful Mocha alternative. Thanks Andrew and Crew! I added Ultimate Whey Protein Isolate to my overall fitness plan. I consume one serving before or after my workout and I have been impressed with the results. 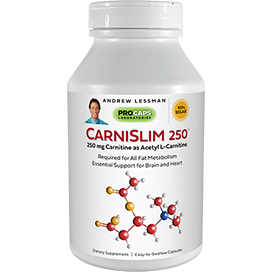 This product has helped me meet my strength and cardio training goals. I was particularly excited about my improvements with running; I shaved one minute off of my per mile time! Absolutely superb! I love it plain, I also love it with a drop or two of vanilla extract in it. I love it with anything and everything that I have added to it. Thank you, Andrew, for this excellent product and for all that you do. I'm a Lessman junkie! I add this to my morning smoothie for additional protein that is not soy or wheat based. Blends well and is unflavored so the smoothie flavor is not compromised. I actually notice a difference in my stamina if I do not use this. Thanks Andrew for continuing to research and improve products. I use this powder every Sunday morning before church, as I am not hungry but want something in my stomach. It mixes great and tastes great! It is the only protein powder that I will use. I do have a request: Please make it in other flavors; like chocolate or vanilla. Thanks! Tried it in a small 4-6 oz. glass with cold water and it is great. Almost like milk. It makes a great snack or post workout source of protein. I add one scoop to one scoop of my usual shake mix, instead of my usual 2 scoops of my shake mix. It makes anything creamy and thicker. It's good to tone down the sweetness of Secure too if you use that. 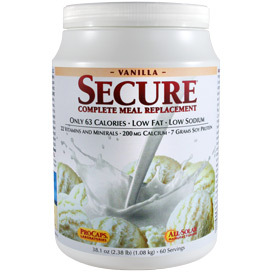 Use one scoop of secure and one of this and it will still be lo calorie and not so sweet. Love it. Thanks for the special pricing you just had in January. I bought two! I love this product and currently have the unflavored. Starting on a journey to lower my sugar as I am a Type 2 diabetic by increasing my protein intake per my Dr. This will also help with hunger. Thank you. Howdy Andrew, I consider myself special within your company; yes, I have 38 different bottles of vitamins from you, which I take daily and love doing it as I'm 78 years young and desire to stay healthy. Andrew, please make a chocolate whey protein powder. I take the plain one now but add a tablespoon of cocoa to it everyday. Would much prefer your chocolate. You are the best . . . . keep it up son!!! :) Regards, Jane D.
No taste. You choose the rest of the ingredients. Great source of protein. You will enjoy this product. I have tried virtually every whey protein product on the market...if it's on the shelf of the vitamin/nutrition store, I've tried it...this product surpasses them all. This powder mixes instantly - no clumps left on the bottom of my mixing cup like the others leave behind. 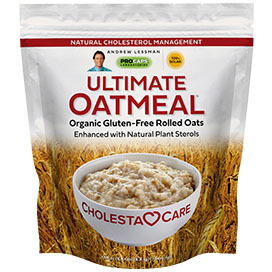 Although "unflavored", it has a very palatable taste alone, or mixes nicely with any other flavors you care to add - I mix this with a scoop of the Secure Meal Replacement as a breakfast/meal substitute and blend into unsweetened almond milk. Love it!! Did I say, Love this product. I love the fact that it has no sugar, and more protein than the other protein product. I like that I can add fruit and or vegetables without tasting anything else in my drink. Thank you Andrew for another home run! Love the taste, texture and how smooth it mixes. No lumps, after taste or chalkiness. I wish the protein, calcium contents were higher and sodium much lower per serving. Being a bariatric patient I need double/triple the protein content as a meal replacement and I do not want to use two or three times the product due to the cost. A bit high priced especially for those that need to use it a multiply times per week, but if you don't like how your old products leave an unpleasant after taste, have a texture short of eating a piece of chalk and wonder why lumps are still in the mix when you use a blender you will be happy with this product. Three stars would have been 5 if price was lower and protein, calcium content higher and sodium lower. *Source of a negligible amount of cholesterol, saturated fat and sugar. **Source of a negligible amount of fat and saturated fat. Contains a Primary Ingredient Derived from Milk.